Bicycle! Bicycle! : Retro Raspberry Beret. 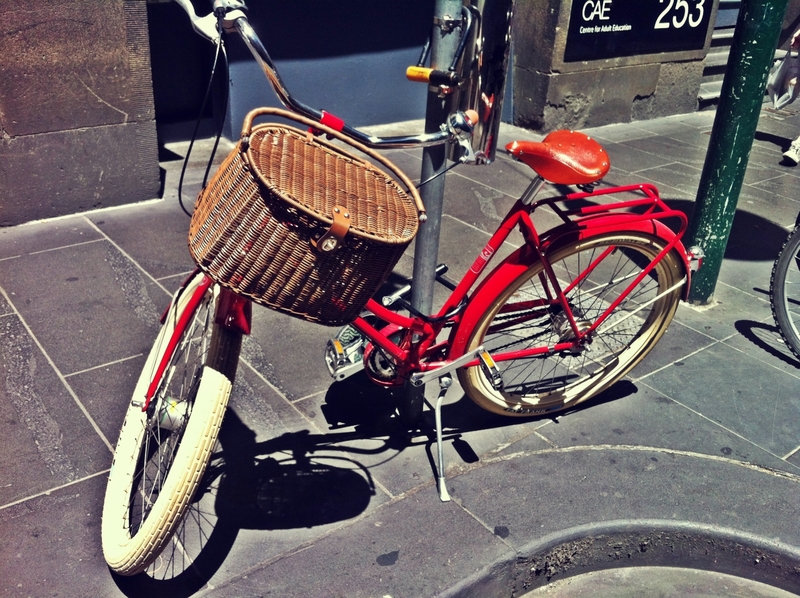 What a Bicycle-Chic treat! 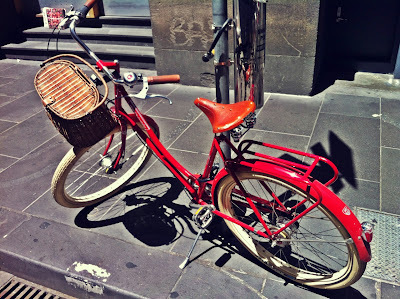 Drooled over in Melbourne CBD; a German Retrovelo in classic red. I forgot to see how many gears it had so I don't know if it's a 'Klara' or Paula' (And I always feel weird getting too close to strange bicycles.) but both models have the same lovely lights, flirty fenders, cushioning cream Schwalbe tyres and every other disturbingly sexual alliteration one might wish to apply to an inanimate object. Looks like a Basil 'Beauty Shopper' rattan look basket with the stem mounted quick release rather than the more common handlebar attachment. In fact, they seem to have removed the headlight in favour of the basket! Looking at the Retrovelo website, the front light comes mounted very high up, directly where the basket mount on this bicycle is sitting - so I can see they would have conflicted. How lucky for me that the Pashley light was already positioned to accommodate a basket. It seems a bit myopic of Retrovelo to do otherwise. I've yet to try a bicycle with balloon tyres, it's on my list of future bicycle experiences. I bet it makes for a smoother inner city ride. Other features of note include the warmly hued Brooks saddle, colour matched grips and the rear rack sprayed the same colour as the frame, something I always find extra appealing. The Retrovelo site says that the rack is an optional item. Well, good decision, Person Who Bought This Bicycle! I hope it was still there when you returned. According to the Retrovelo website, there is but a single dealer in Australia - In Victoria of course. Perhaps one day I'll get a test-ride. Until then, I can only suffer some serious bicycle envy. Love that red.